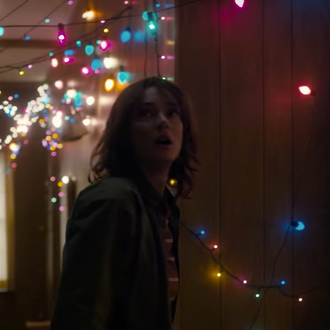 If you’re a fan of Twin Peaks, ’80s sci-fi, and kids riding around on bikes until they stumble into a mysterious adventure, you’re probably already watching Netflix’s new series, Stranger Things. The show is set in 1983, and focuses on a small town in Indiana where a young boy goes missing. But one of the best parts of the show is the period-perfect synth score by Kyle Dixon and Michael Stein, who are part of the Austin band S U R V I V E. For now, a collection of era-specific songs used in the show can be streamed on Spotify. But today, according to FACT, the Stranger Things Facebook page announced that an official soundtrack would be “coming soon”. S U R V I V E also has their own record on the way, called RR7349 (Relapse Records). Update: Stranger Things has announced that volume one of the soundtrack will arrive this Friday, August 12, with the second volume to follow on August 19. Volume one will consist of 36 songs named after scenes from season one, because all monster hunts should require an original score. Listen to its synth-y first song, “A Kiss,” below.